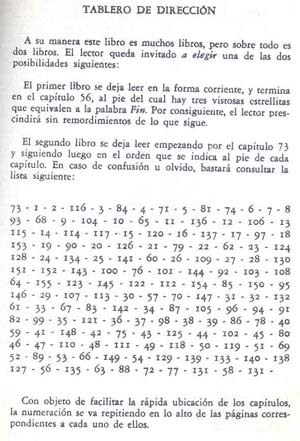 The other night I started to read a novel by Argentine writer Julio Cortázar called “Rayuela” (Hopscotch). The novel is widely hailed as a classic of 20th Century literature, but also coincided with the so-called Latin American Literary Boom that occurred around the time of its publication in 1963. The novel is complicated in structure and mythically so. It contains two books, the first part which is the central story and the second part, which is referred to as the “Dispensible chapters” (capitulos prescindibles). Immediately before “Chapter 1” is a brief instruction from the author which is essentially a suggestion of how to read the book. One way is to read chapters 1 to 56 directly and finish with a clear conscience. The other is to use the authors table (see picture) by which chapters from part one are intercut with more abstract passages from the dispensible chapters in part 2. That is, movement through the book is backwards and forwards, almost like one of those old Choose-Your-Own-Adventure books. There is a certain irony at the end of the book too, as the penultimate chapter leads to the final, which in turn leads back to the penultimate, and so on. In addition to this unconventional movement through the pages is the use of different styles and narrative points of view within the story, switching from first to third person and using stream of consciousness. The reference points are clearly writers like James Joyce, French contemporaries of the Nouveau Roman school, but more so Surrealism and perhaps not surprisingly jazz. Cortázar was born in Brussels at the time of the German occupation in 1914, moving via Switzerland and Barcelona to Buenos Aires by 1919. He remained there during his formative years and beginning to publish his first writings until 1951 when he moved to Paris as a protest against the government and politics of Juan Domingo Perón. That is to say, that Cortázar was in Paris during the fecund years of the 50s and 60s when American jazz greats would tour and play at the heights of their powers to a receptive and respectful audience unencumbered by the inequalities in civil rights back home. 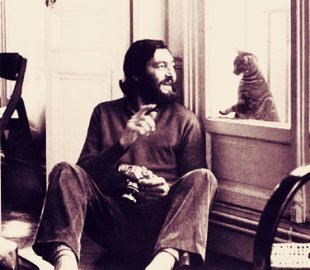 “Rayuela” and many other works by Cortázar are influenced heavily by jazz and in particular their improvisatory techniques. In “Rayuela”, for example, the characters form El Club de la Serpiente (the Serpents Club) to listen to music. Cortázar has also written articles on jazz such as “La vuelta al piano de Thelonius Monk” (Thelonius Monk’s return to the piano) based on a 1966 concert in Geneva, whereas Michelangelo Antonioni's 1967 film "Blowup" was based upon a short story entitled “Las Babas del Diablo” (The Droolings of the Devil"). Here is the famous Yardbirds scene from the Blowup film. Note also that the street in Soho, London where this was filmed is also the same location that appears in the mythical “Ziggy Stardust and the Spiders from Mars” album cover by David Bowie that would appear a few years later. Perhaps the most famous of his work linked to jazz was “El Perseguidor” (The Pursuer) which was first published in the short story collection “Las Armas Secretas” (Secret Weapons) in 1959. This story is based around the protagonist Johnny Carter, himself modelled on be-bop saxophonist Charlie Parker and was a turning point in Cortázar’s style and influence. Not surprisingly, Cortázar has influenced many musicians and other writers. In 2004 a combined book and CD called “Jazzuela” was published by the writer Pilar Peyrats Lasuén incorporating all the parts of “Rayuela” that refer to jazz and all the tracks referred to in the book. Tango-trip hop group Gotan Project also have a track named after and inspired by Cortázar featuring text from the mythical Chapter 7 about a kiss. Whereas another track simply entitled “Rayuela” from the “Tango 3.0” album also draws unambiguous inspiration. How great! I'm from Argentina and I'm reading Rayuela right now. Great post. I was looking for the right traduction of that quote about music and life, and found your amazing blog. Keep on reading good books, and have a nice life. Y recién leo que sos de España y yo hablándote en inglés. Hola, gracias por la repuesta y estoy alegre que te gusta el blog! Rayuela es una maravilla aunque fue muy dificil leerlo en castellano para mi . Me gustaría intentarlo en inglés también para ver lo que perdí. Ya estoy leyendo Gabrial Garcia-Marquez El Amor en los Tiempos Del Colera y es más lirico y más facil pero menos musical en tema y por eso no hay un post. Unos saludos a Argentina!